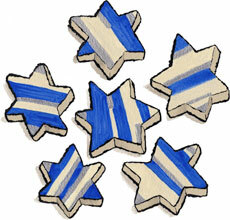 Stars of David Marzipops for sale. Buy online at Zingerman's Mail Order. Gourmet Gifts. Food Gifts. Marzipan is a firm, chewy confection of almond and sugar (no egg whites so it's vegan) with a sweet, floral almond flavor. These confections were made right here in Ann Arbor, where the marzipan masters at Marzipops have shaped the candy into Stars of David and hand painted them with blue and silver stripes. A great gift for kids or to nibble with tea or coffee.